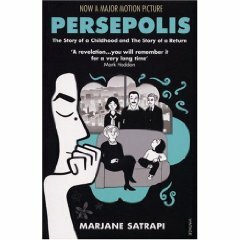 Persepolis holds an interesting position as 1) being one of the few non-superhero graphic novels that many people who don’t ordinarily read comics or graphic novels have heard of, largely thanks to the recent film, 2) written and drawn by a woman. There have, of course, always been women writing, drawing, inking and lettering comics, and point 2) is fortunately becoming less of a rarity. Nevertheless, it’s still relatively less common to find a female writer and artist (test for this: name the top three comics writers and artists that come into your mind – I would put money on them all being male). That point aside, what to say of Persepolis? Mainly that the gender of its author is irrelevant, inasmuch as it’s a very good graphic novel, and would be if the author were female, male, intersex, or an alien from Planet Zog. Of course, the author’s gender is relevant. Satrapi’s account of life growing up in 1970s Iran would be radically different if she were male. This is apparent all the way through, particularly in the second half of the story (Persepolis consists of two books, now often sold in one volume: “Persepolis: The Story of a Childhood” and “Persepolis: The Story of a Return”). In recounting her return to Iran following her struggles to adapt to life in Switzerland, Satrapi honestly recounts the struggles of young women in Iran to live their lives under a repressive regime. Fortunately, this is not misery-lit. Those looking for an ooh-isn’t-it-awful account of downtrodden women suffering under the hand of Islamic patriarchy will look in vain. Satrapi’s self-portrait is honest: intelligent, spiky and perceptive, she can also be self-centred, vain and self-destructive to the extent that there may well be parts of the book where some readers will decide they really don’t like her very much! The black and white art is deceptively simple and effective, though a word of advice: there is a paperback book- sized edition out which contains both books – don’t read it in this format because the text is very small! If you can get hold of a proper, graphic-novel-sized version, go for that. Overall, Persepolis rightfully takes its place on the shelf of “modern classic” graphic novels, and comes highly recommended.